The first review (by experts) of the IPBES global assessment of biodiversity and ecosystem services draft chapters will close on 15 August 2017. One of the most important phases in the IPBES assessment process is the external review by interested and qualified experts, including scientists, decision makers, practitioners and other knowledge holders. You still have time to contribute to the global assessment review process! 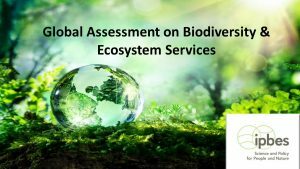 This is the first global assessment since the Millennium Ecosystem Assessment that will provide decision makers with the state of knowledge regarding the planet’s biodiversity, ecosystems and the contributions they provide to people, as well as the options to protect and use these natural assets more sustainably. Furthermore, the global assessment will provide vital data to assess progress against the Aichi Biodiversity Targets and the Sustainable Development Goals (SDGs). Thank you for registering to participate in the first review (by experts), thereby contributing to the high standards of IPBES assessments. If you haven’t already done so, we kindly remind you to review the drafts and submit your substantive comments to hien.ngo@ipbes.net. Please bear in mind that all review comments must be submitted by the deadline of 15 August, using the official template for review comments, which is available on the website containing the draft chapters. In order to make the strongest impact worldwide and reach the widest-possible range of experts from your country, institutions and/or networks, IPBES Denmark would like to request your help in spreading the news about the review to any of your colleagues who may also wish to participate. The more diverse the engagement, the greater the credibility, legitimacy and policy relevance of the assessment. Thank you again for your interest in IPBES and assistance in strengthening the IPBES global assessment.